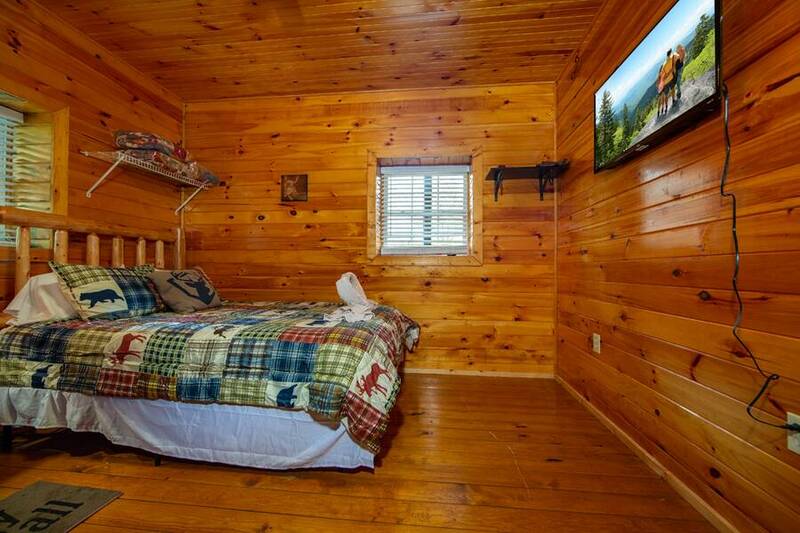 This cabin has been completely renovated, from top to bottom, in November 2018 with all new furnishings, décor, and bedding. 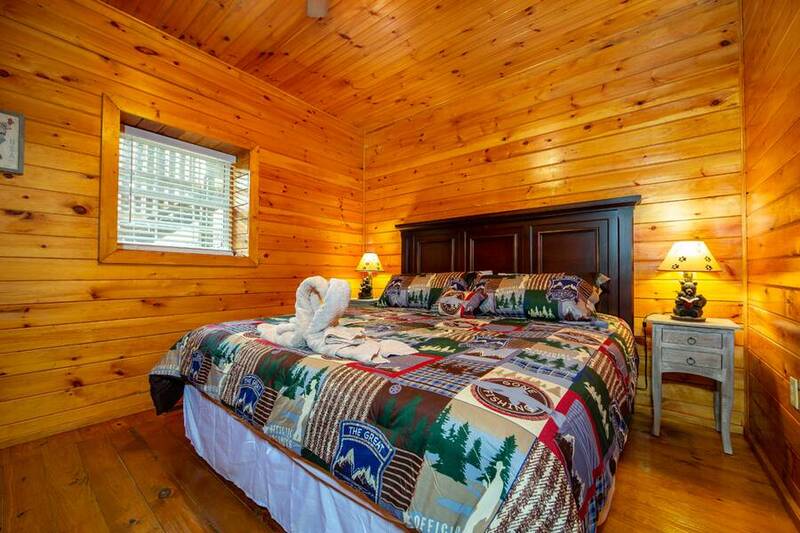 Welcome to Hideaway Lodge in Pigeon Forge! 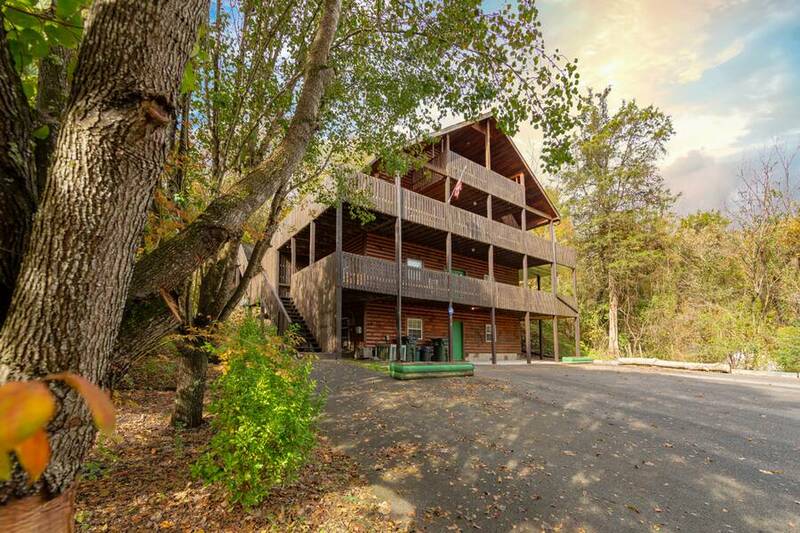 This 7 bedroom, 3 bath Smoky Mountain cabin rental is the perfect getaway when travelling with a large group of family and friends. 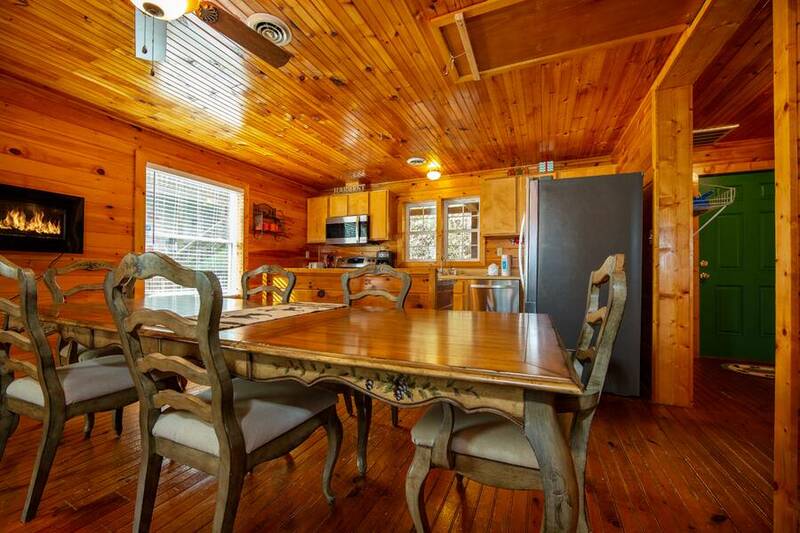 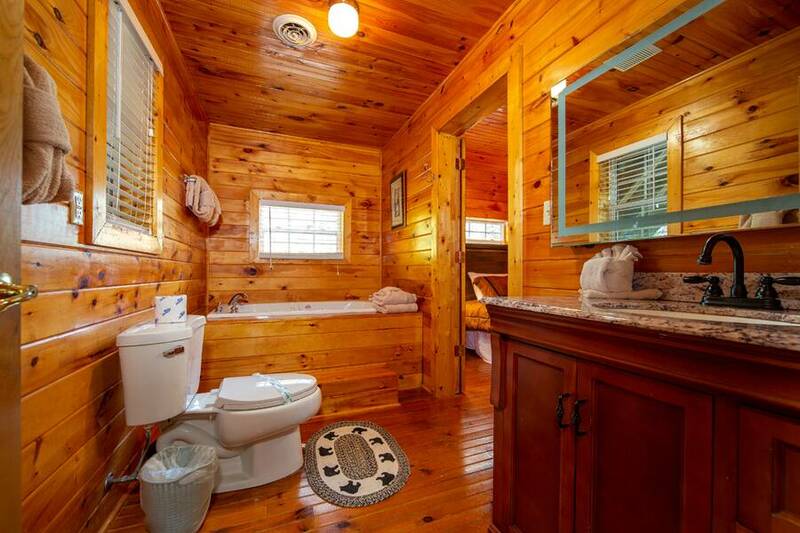 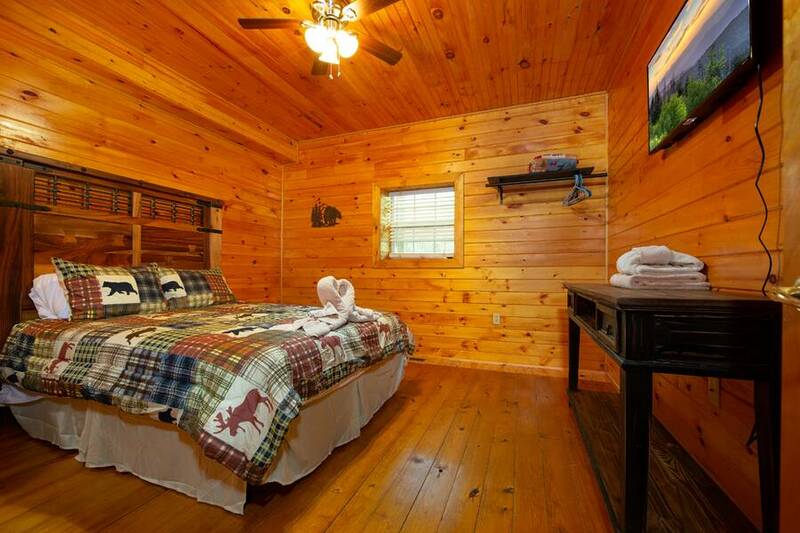 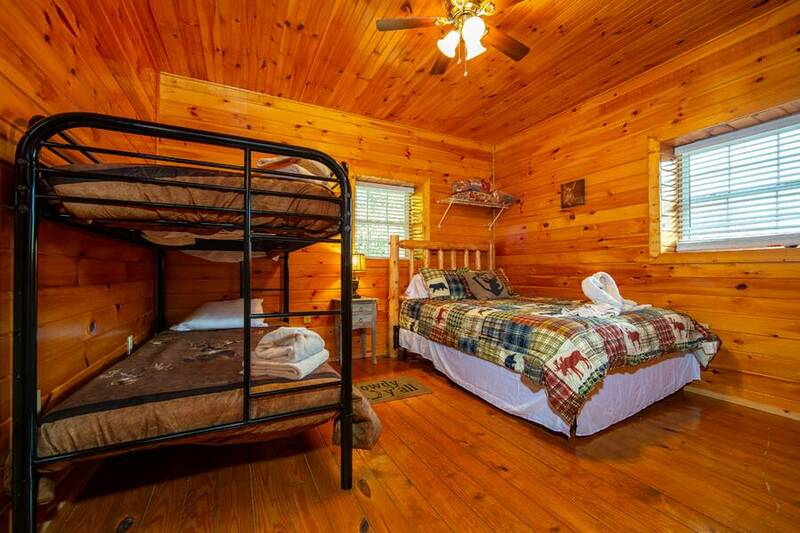 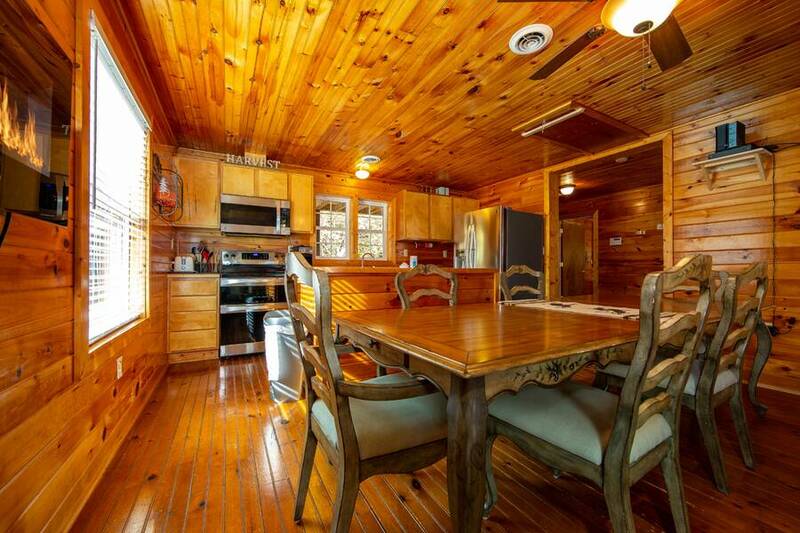 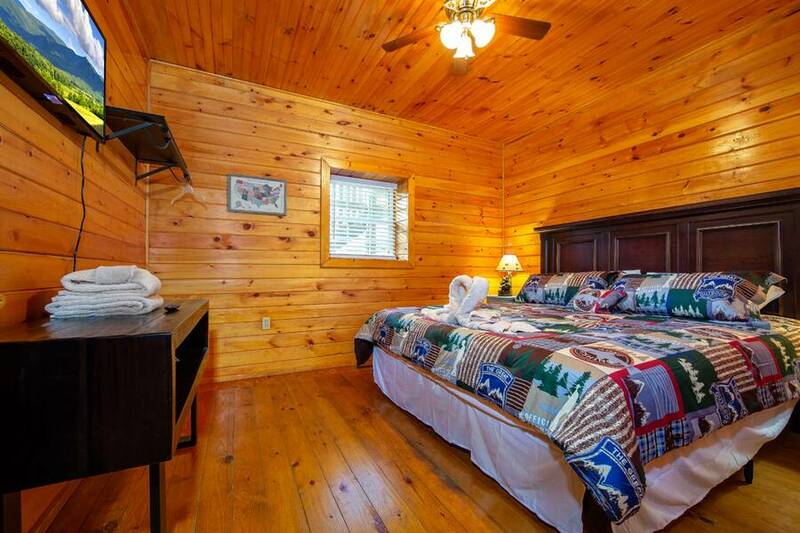 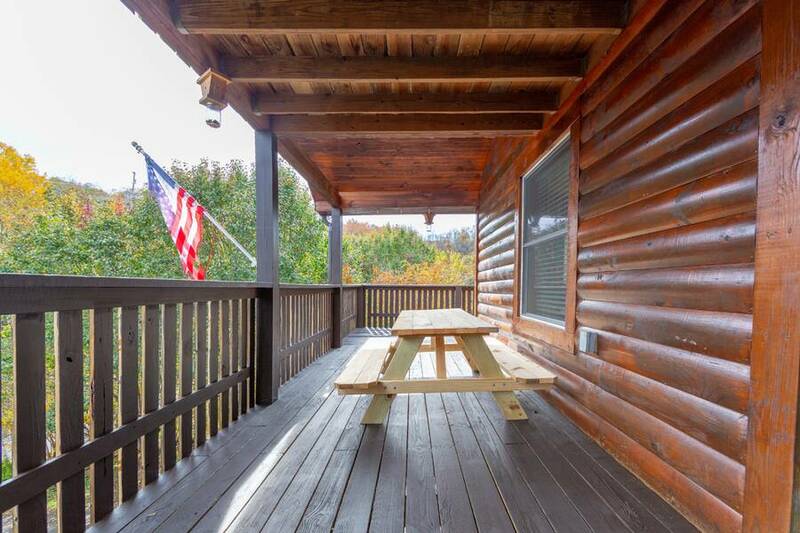 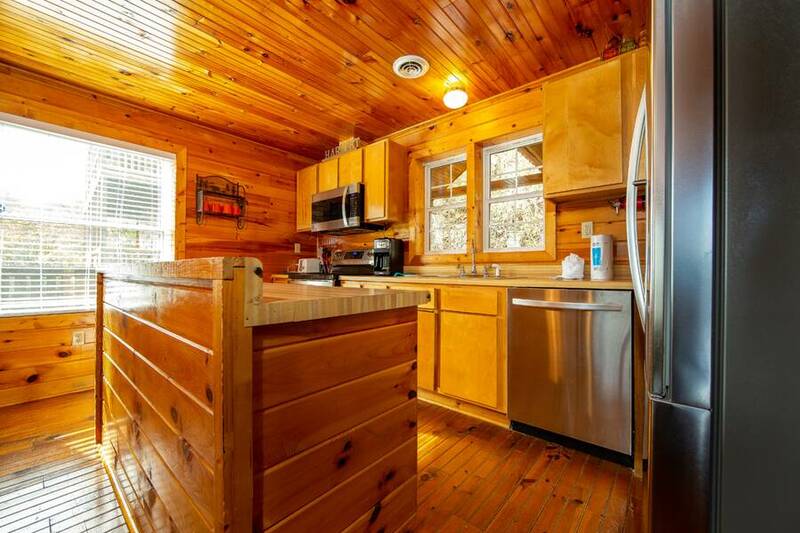 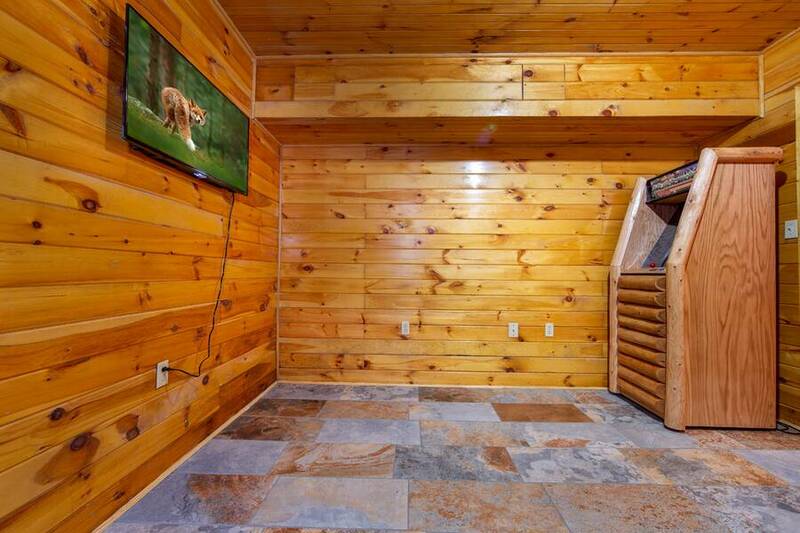 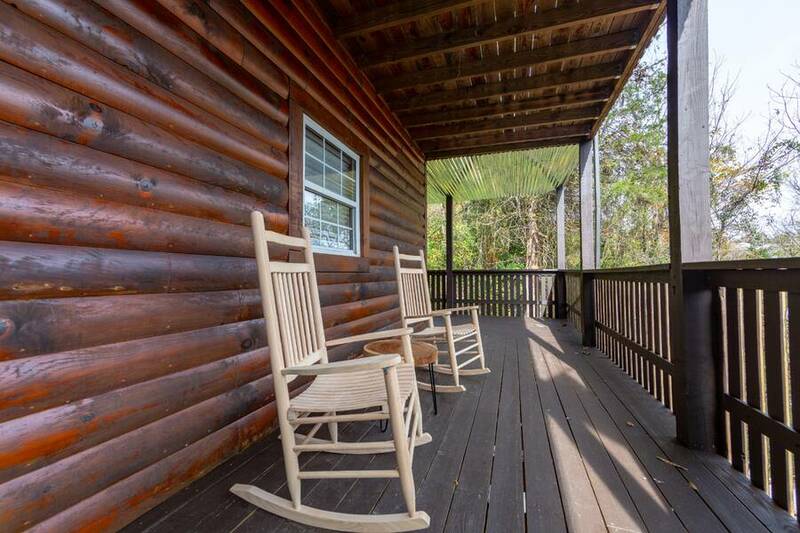 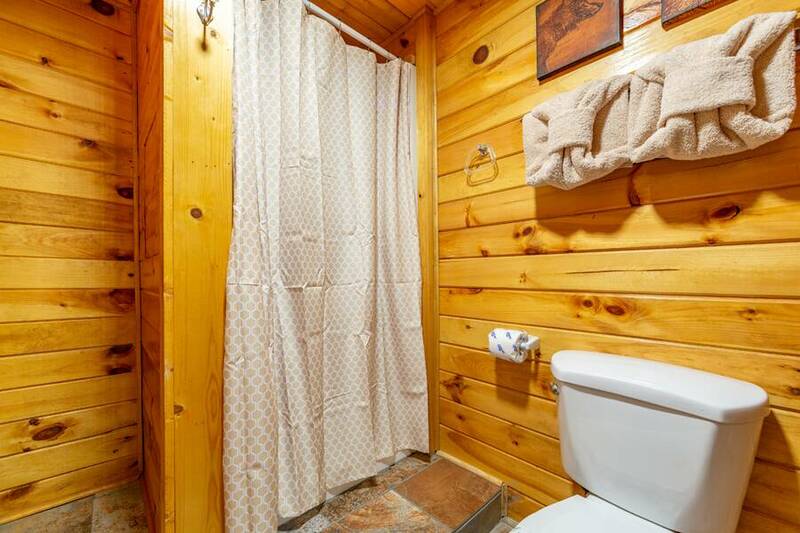 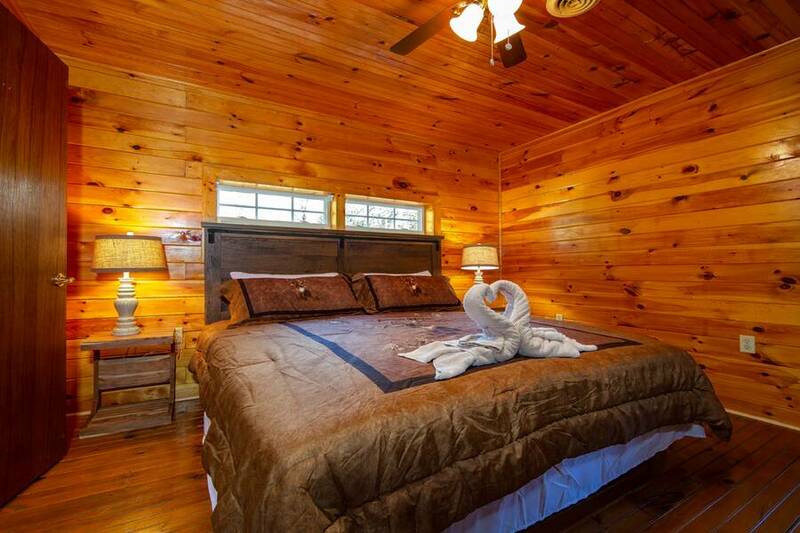 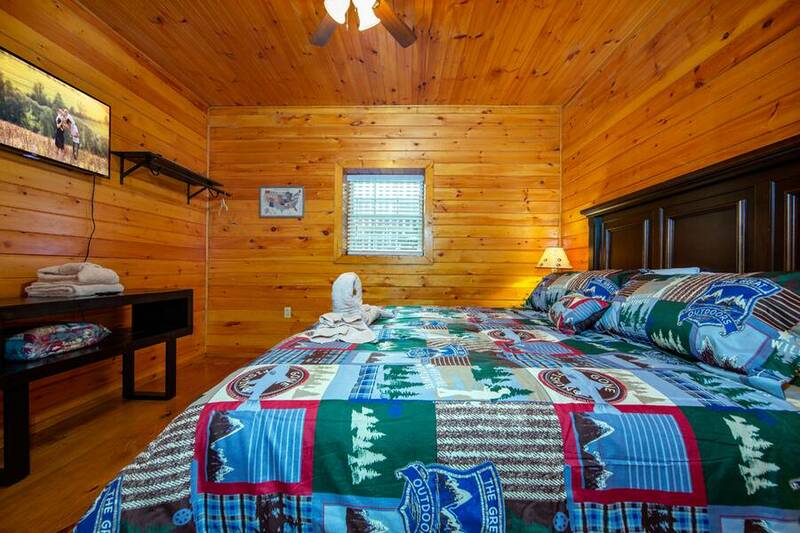 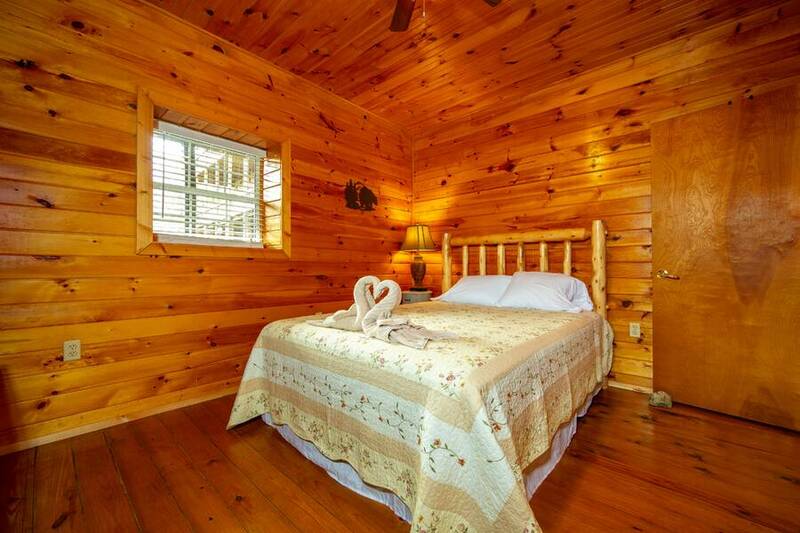 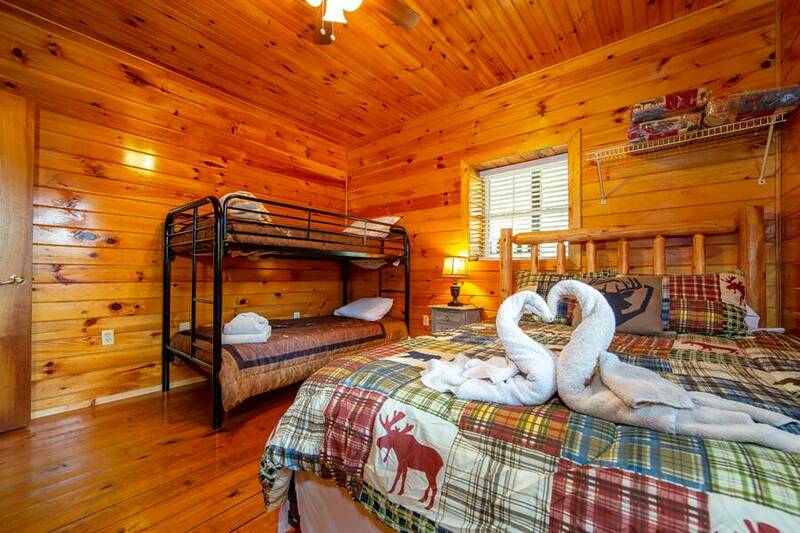 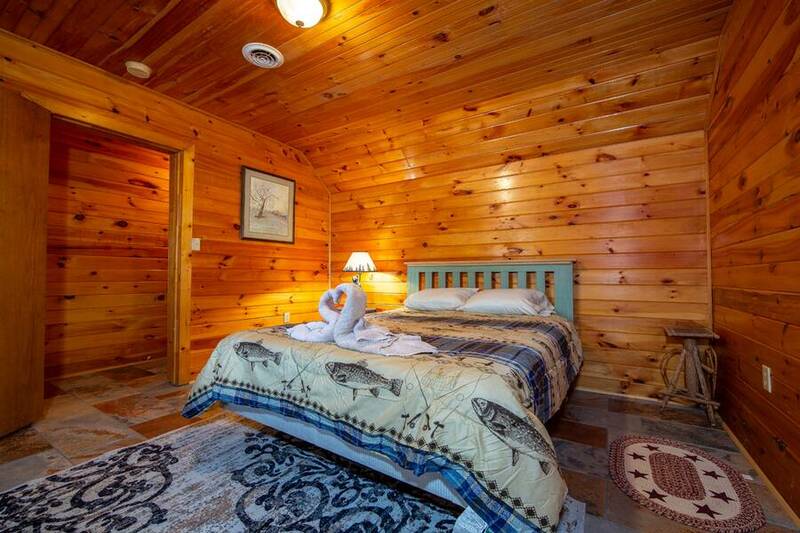 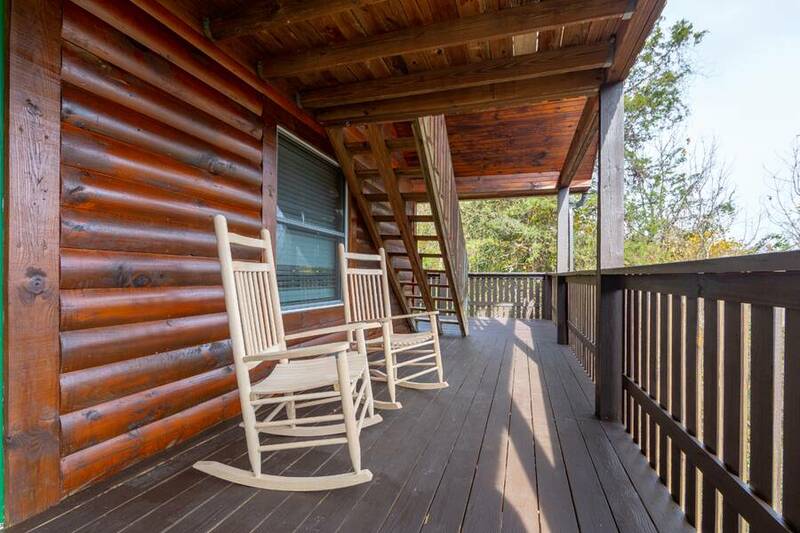 Spanning 3 levels, this log cabin rental has plenty of space for everyone to feel right at home while on vacation. 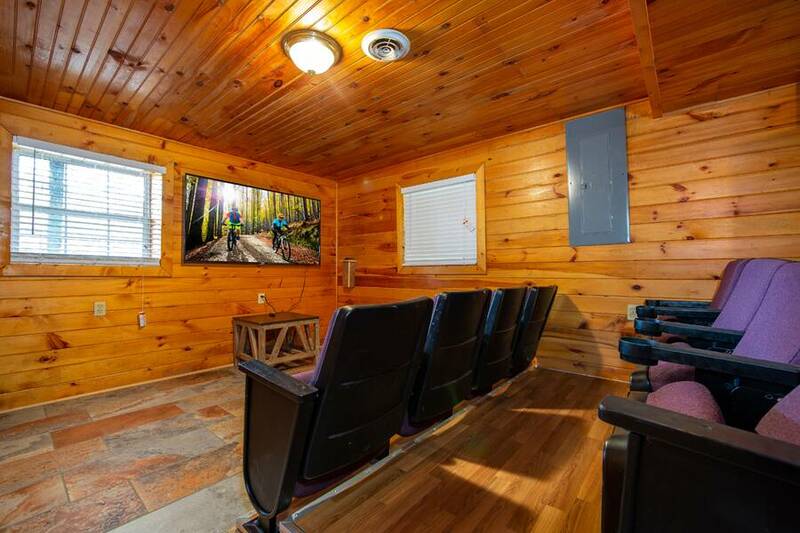 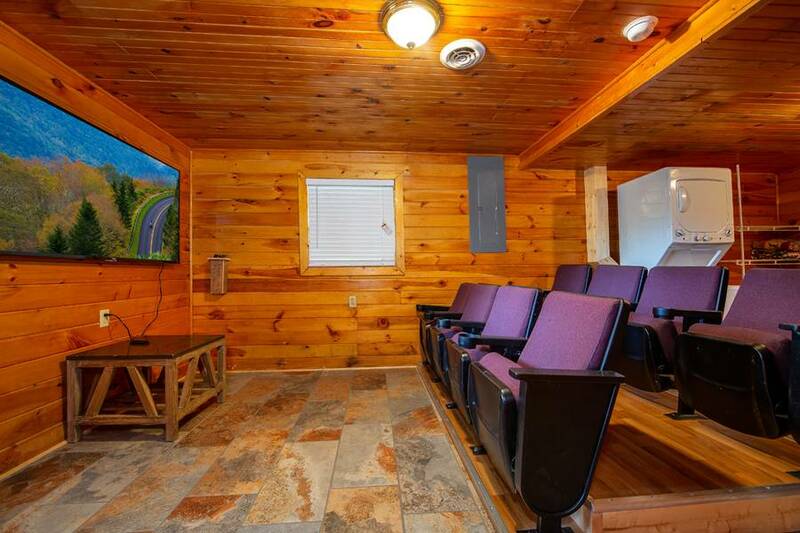 The lower level features an in-cabin movie theater that’s perfect for watching your shows or sporting events on the big screen with bunk sleeping area. 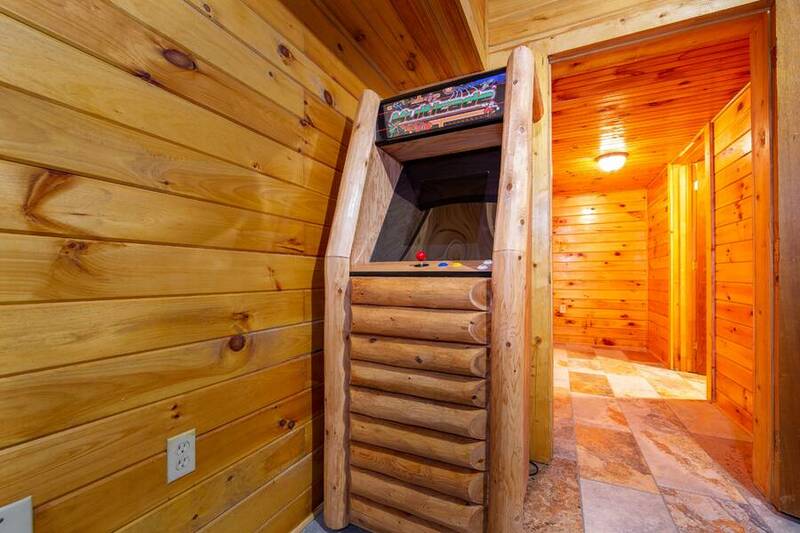 Also, located on the lower level is a bedroom, a full bath, and a recreation room featuring an arcade game with over 50 classics including PacMan and Donkey Kong, an air hockey table and an indoor basketball game. 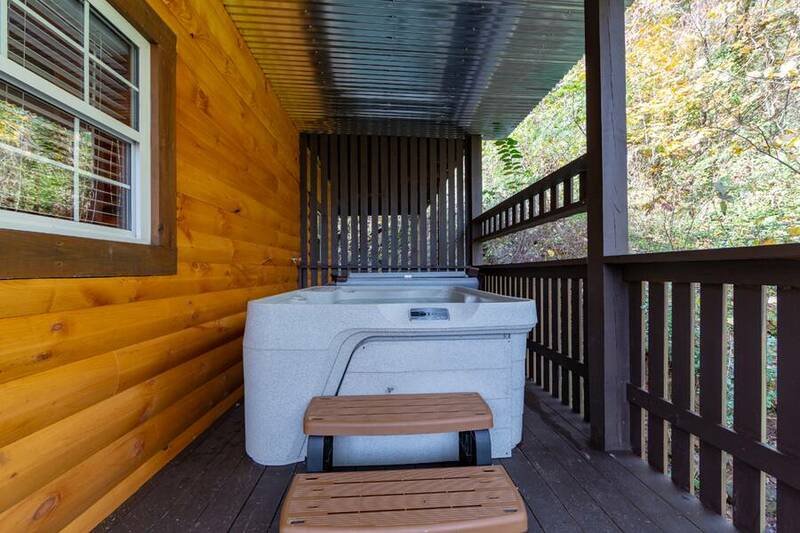 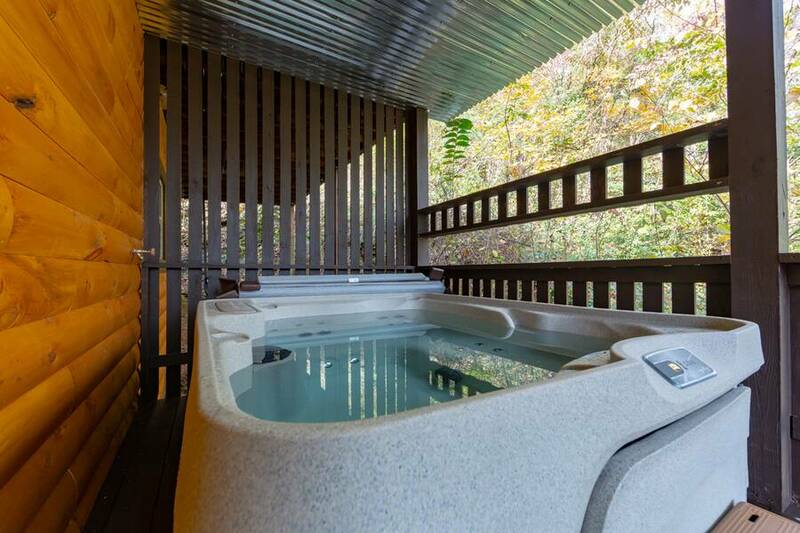 The middle level of Hideaway Lodge offers 4 wonderful and relaxing bedrooms, a full bath, and wrap around deck access to the bubbling outdoor hot tub. 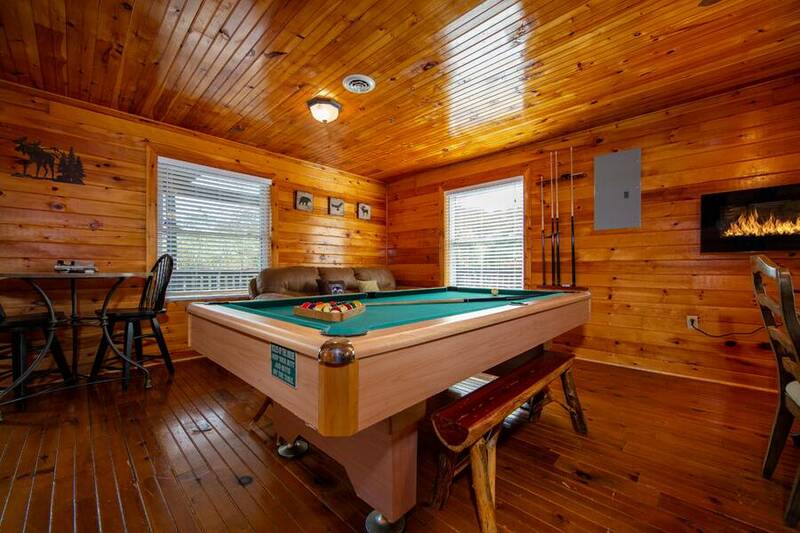 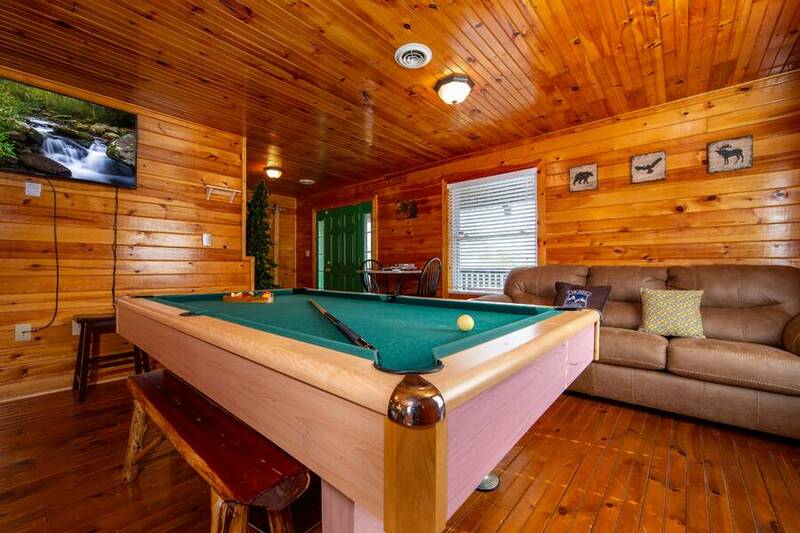 Located on the upper level of this Smoky Mountain vacation getaway, you and your guests are treated to a full kitchen with adjoining dining area, a living room with sofa, pool table, flat screen TV, and convenient deck access. 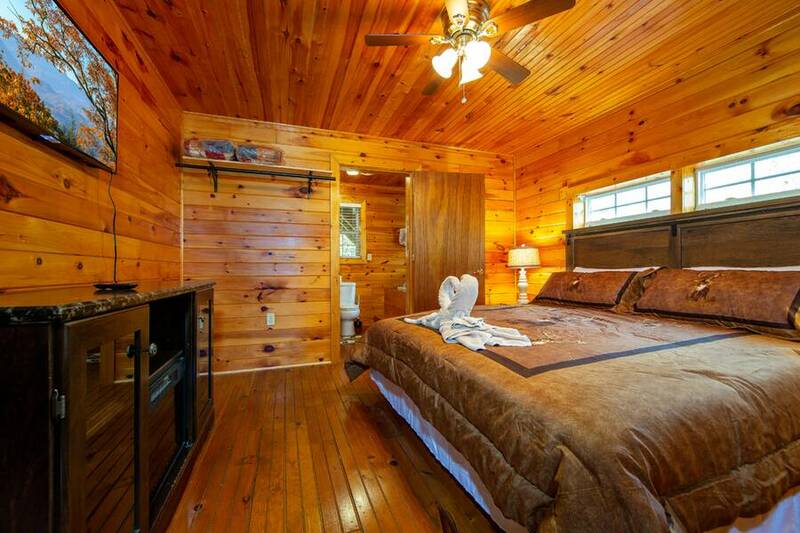 Additionally, this level features a master suite with jetted tub and a large flat screen TV. 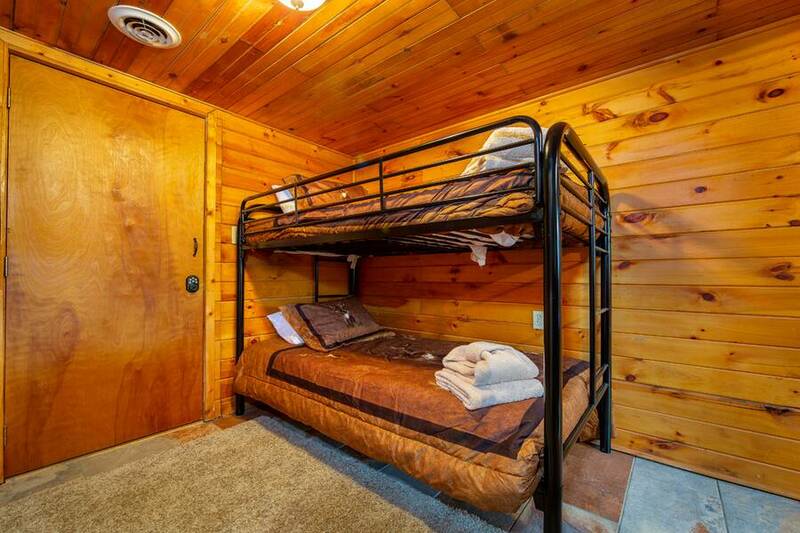 There’s an additional bedroom located on this floor as well. 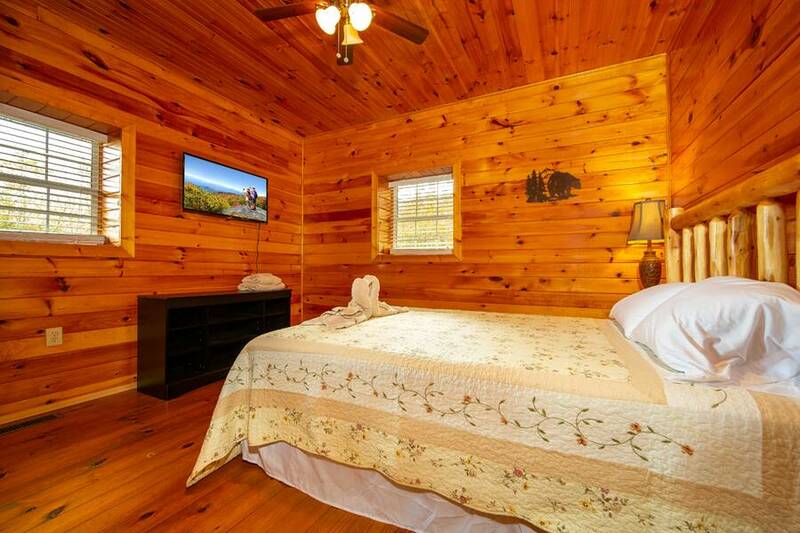 Hideaway Lodge offers it’s guests complimentary high-speed WiFi internet, so be sure to back along your tablets, laptops, and smart devices. 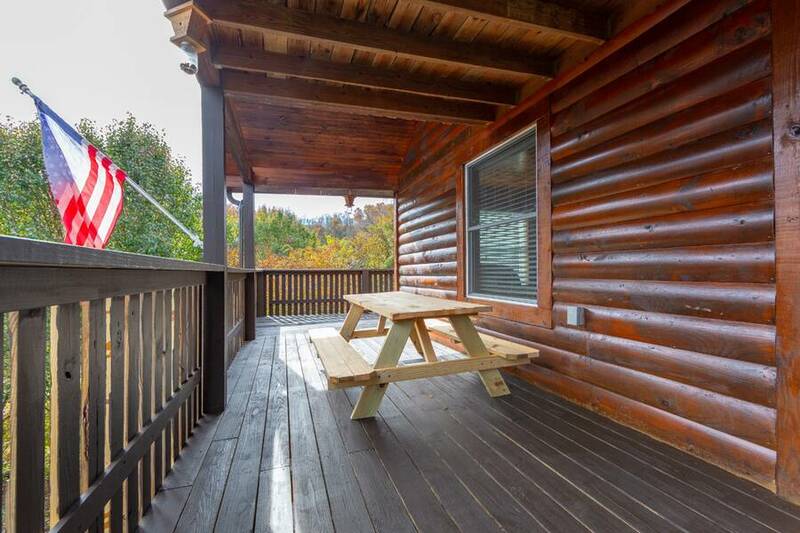 Parking and access to this Pigeon Forge vacation rental is very easy. 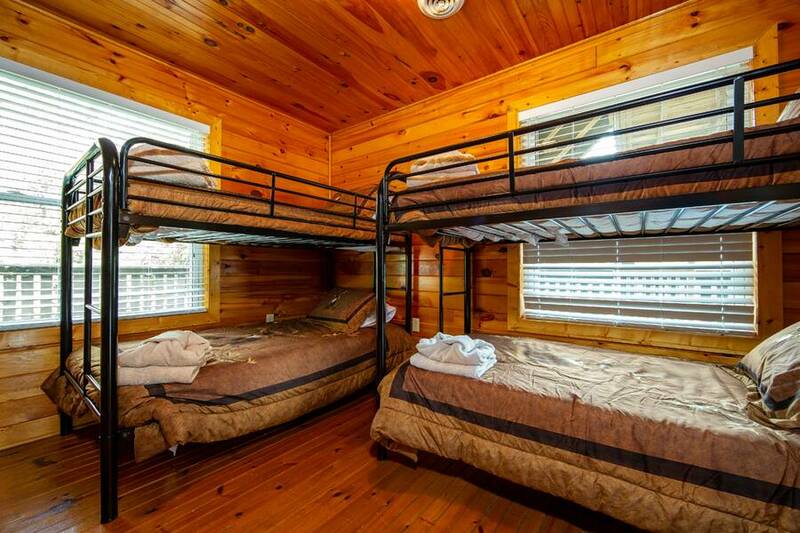 There’s ample for up to 6 cars in one row, or 12 when parked in a double row. 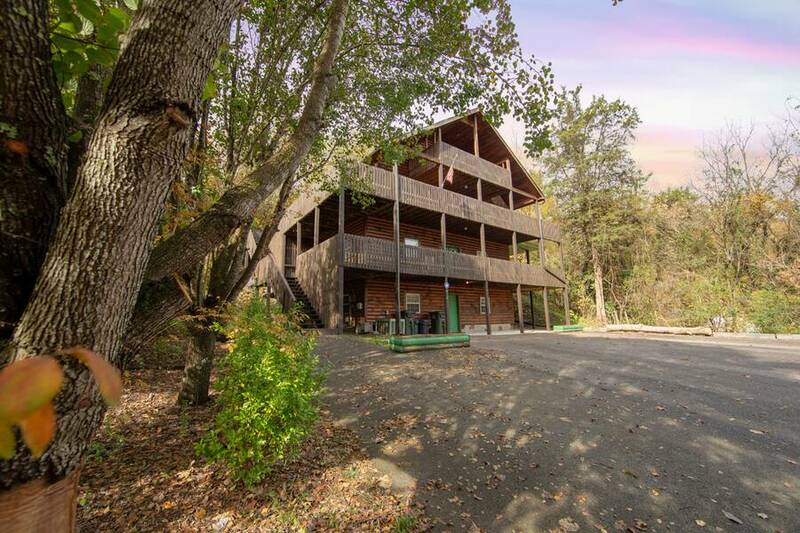 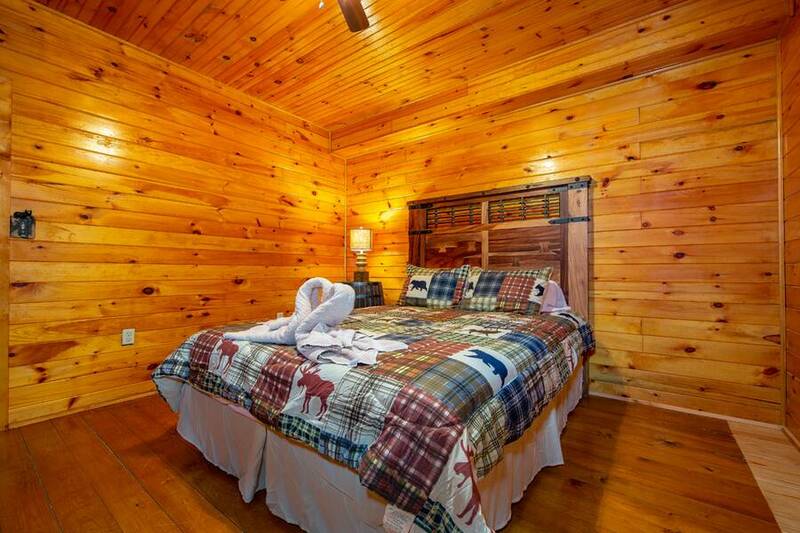 If you’re searching for the perfect cabin for large groups, youth sporting events, reunions, or if you’re just looking for a great Smoky Mountain vacation getaway to accommodate your large gathering in the Smokies, plan your stay at Hideaway Lodge today! 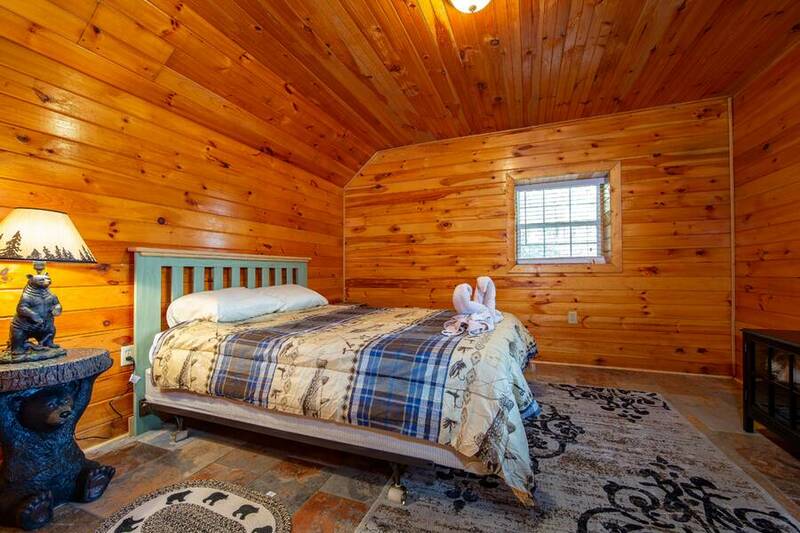 A: Hi Carla. 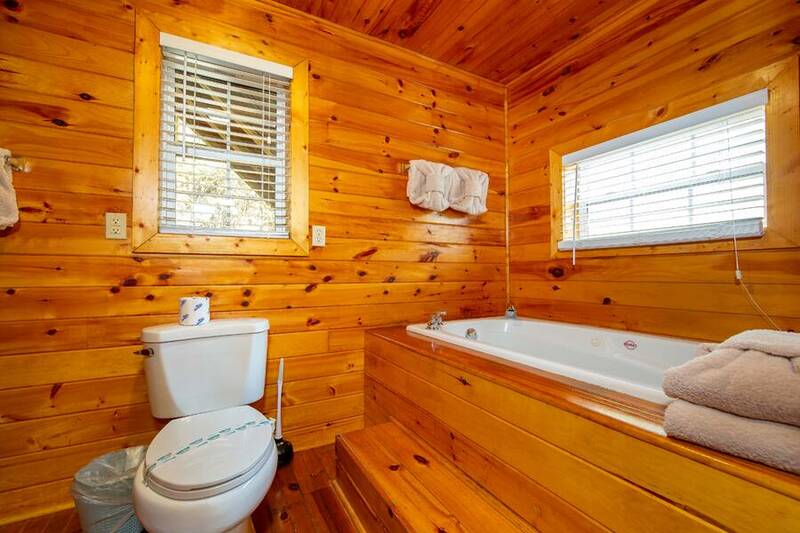 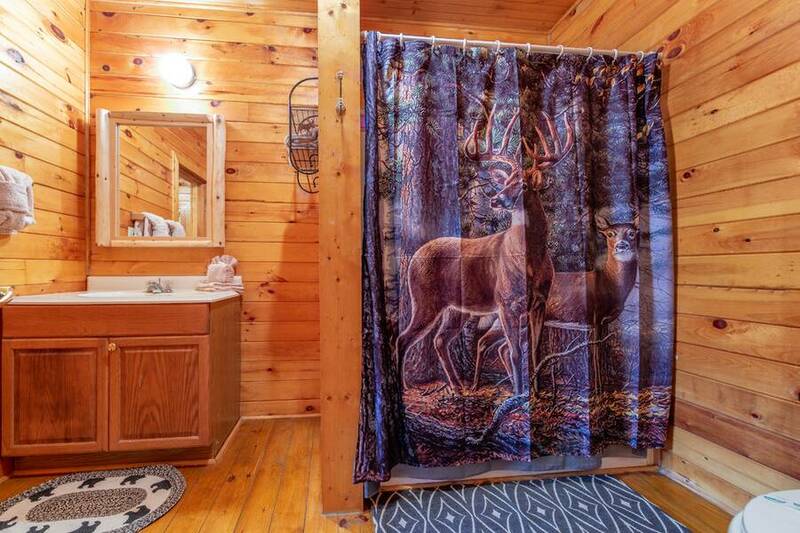 There is no pool access for this cabin.